THE EBS REIDMAR 502. EBS BREAKS NEW GROUND WITH A LIGHTWEIGHT BASS AMP FEATURING A NEW CLASS D POWER MODULE CO-DEVELOPED BY EBS THAT TRULY HANDLES A 2-OHM LOAD. The EBS Reidmar 502 handles a 2-ohm load so it can drive two 4-ohm cabinets simultaneously. To our knowledge, it is the first lightweight amp in the 500W-range that truly does that. And it does it with conviction too. Efficient power handling. Due to EBS clever developed Soft-clip design, the Reidmar 502 makes efficient use of all the power at hand. That means more punch and a lot less compressed sound than with lightweight amplifiers using automatic limiters to prevent clipping. It keeps the bass tone from sounding muddy and preserve the lows solid on higher volumes. Analog preamp. The preamp, featuring EBS renowned built-in compressor and a 4-band EQ-section, gives you full control. Use it to bring out anything from a warm nice low end, brilliant highs and mids that cut through the mix when you need it. Perfect Companions. If you prefer a compact rig, match the Reidmar 502 with a couple of EBS ClassicLine mini-size 112 cabinets, the new ClassicLine 210 or the NeoLine mini-size cabinets (for more clarity and punch). For a more impressive look or when the gig calls for an even more powerful bass tone, you can use the Reidmar 502 with a couple 4-ohm, 410 cabinets as well. 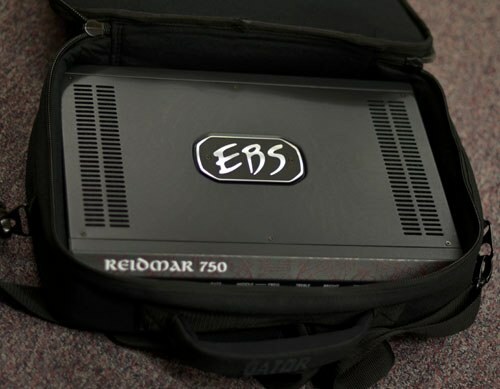 THE EBS REIDMAR 750 IS BASED ON THE AWARD WINNING DESIGN OF THE ORIGINAL REIDMAR AMPLIFIER, WITH SOME ADDED FEATURES. THE 'BOUTIQUE' AMP TONAL QUALITIES PAIRED WITH A POWERFUL 750 W AMP MAKES THIS A SERIOUS AND PORTABLE CHOICE FOR ANY MAJOR STAGE GIG. A Natural beast. EBS always put the sound first. 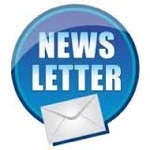 Any product should offer a natural sound that reflects the character of the instrument and personality of the musician. The award winning EBS Reidmar design is no exception from that philosophy! Due to advanced soft-clip technology, the Reidmar amps does not suffer any loss of definition in the low register when the volume is turned up. It does not use a present automatic limiter that kicks in at a certain point and levels out the lows like many other class-D amps do. No, the Reidmar takes maximum advantage of the power offered. The extremely powerful Reidmar 750 model is a real beast that need a matching cabinet to keep up with it's capabilities. This is the light-weight amp for the big stages, easily driving a 4 ohm 410 or 810 cabinet. The Reidmar 750 is equipped with a Drive control to add just the right amount of harmonics to make your bass come alive, or if you prefer, make it just as dirty as you prefer. Technically Speaking. 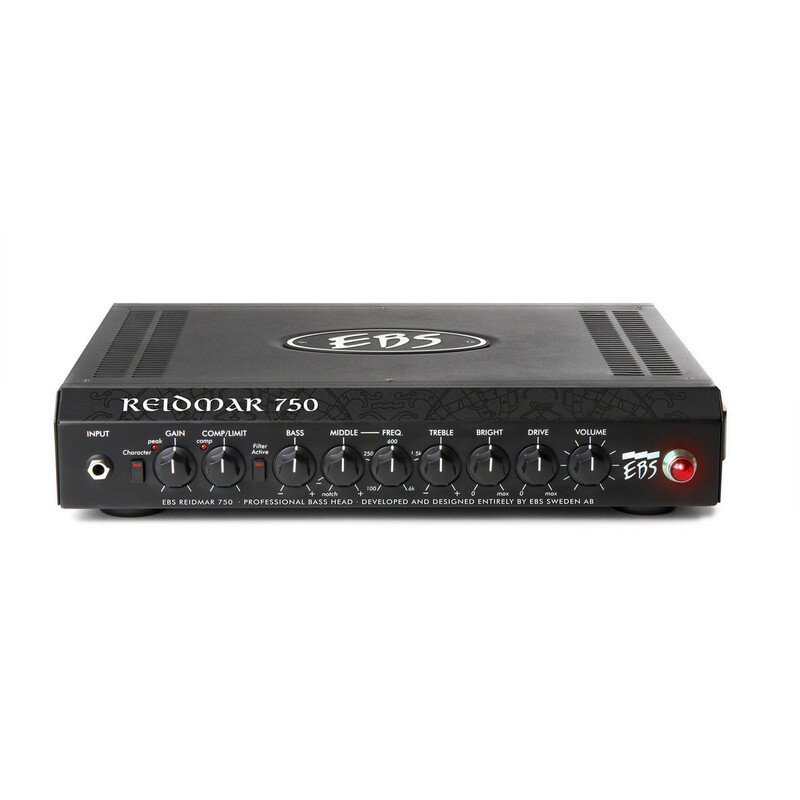 If you are familiar with EBS bass amps you will feel at home with the Reidmar 750. The renowned built-in compressor and the 4-band EQ-section are really intuitive and feature the (for EBS) characteristic Bright and Notch filters and remind you a lot of the layouts of HD360 and TD660. The preamp is analog, and similar to the preamp on HD and TD heads. The amp also features an Effects loop (send and return), Balanced XLR-out for live and studio use (with pre/post EQ switch and Ground Lift), Line out, Headphones out and Speakon speaker output. A couple new features on the back are the Mini-tele input for adding recorded music to play along to when practicing, and the Remote Control Connections to add a footswitch, such as the EBS RM-4, to switch on and off Character Filter and Drive, bypass the EQ or Mute the amp. The amp processes the sound through an analog preamp with a D-class power amp providing 750 W @ 4 ohms load. Weight is 3.7 kg (8.2 lbs). Be careful. The EBS Reidmar 750 is extremely powerful. Therefor we recommend using it with a larger 4 ohm cabinet, such as a 410 or even an 810 cabinet, if preferred. CAUTION! If you still use it with smaller cabinets, make sure to be careful with the output volume to avoid blowing up the speakers. 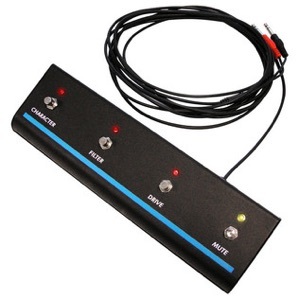 Optional RM4 footswitch - Four separate footswitches in one device for controlling Drive, Character, Filters and Mute. 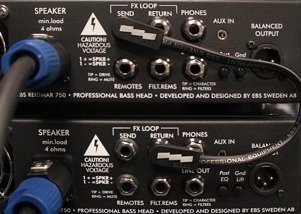 THE EBS REIDMAR IS THE FIRST LIGHT-WEIGHT BASS HEAD FROM EBS PROFESSIONAL BASS EQUIPMENT. A LIGHT-WEIGHT BASS AMP THAT CHALLENGES ANY HEAVY-WEIGHT BOUTIQUE AMP IN TONAL QUALITIES. THE REIDMAR TAKE FULL ADVANTAGE OF EBS FAMED ANALOG PREAMP TECHNIQUE COMBINED WITH A CLASS-D POWER AMP. Natural sound. The EBS philosophy is to amplify the character of the instrument and the personality of the musician, to offer a natural sound. The physical aspects of a class-D power amp makes that mission a real challenge. However, the EBS Reidmar shows that anything is possible with clever engineering! Due to advanced soft-clip technology, the Reidmar does not suffer any loss of definition in the low register when the volume is turned up. It does not use a present automatic limiter that kicks in at a certain point and levels out the lows like many other class-D amps do. No, the Reidmar takes maximum advantage of the power offered. That makes it a powerful, great sounding bass amp that is fully comparable with other heads with larger and more expensive power amps - dynamite! The Nature of the Beast. While offering a powerful and defined sound at most levels, when pushed to the limit it provides a natural and useful amp distortion, like the Drive on a solid state amp, This further extends the possibilities to use the EBS Reidmar in different musical contexts. Technically Speaking. Anyone familiar with EBS bass amps will feel at home with the Reidmar. The renowned built-in compressor and the 4-band EQ-section are really intuitive and feature the (for EBS) characteristic Bright and Notch filters and remind you a lot of the layouts of HD360 and TD660. The preamp is analog, and similar to the preamp on HD and TD heads. The amp also features an Effects loop (send and return), Balanced XLR-out for live and studio use (with pre/post EQ switch and Ground Lift), Line out, Headphones out and Speakon speaker output. The amp processes the sound through an analog preamp with a D-class power ampproviding 250 W RMS/470 W Dynamic Output @ 4 ohms load. Weight is 3.2 kg (7.1 lbs). Perfect Companions. The EBS Reidmar matches perfectly well with a couple EBS ClassicLine mini-size 112 cabinets, the new ClassicLine 210 or the NeoLine mini-size cabinets for more clarity and punch. 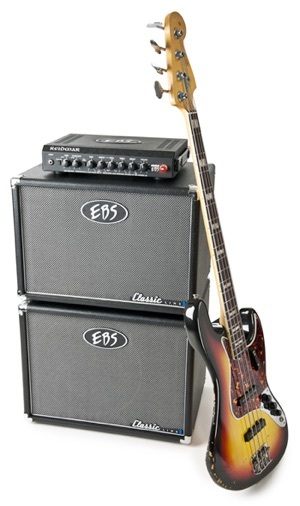 Or any single full size EBS cabinet of choice rated at 4 Ohms for maximum power and tone quality. With two amps together, connected through the Effects loop (Send from one to Return on the other), you can drive two 4 ohm cabinets, getting a separate volume control for each cabinet while using the EQ from the one you plug in to. The amp utilises an analogue preamp with a Class-D power amp providing 250 W RMS @ 4 ohms. It weighs in at a mere 3.2 kg (7.1 lbs)! The Reidmar 250 is perfectly matched with a pair of EBS ClassicLine mini size 110 or 112 cabinets, or the NeoLine mini size cabinets to create an extremely portable but fully featured mini stack, or with any single full size EBS cabinet rated 4 ohms.